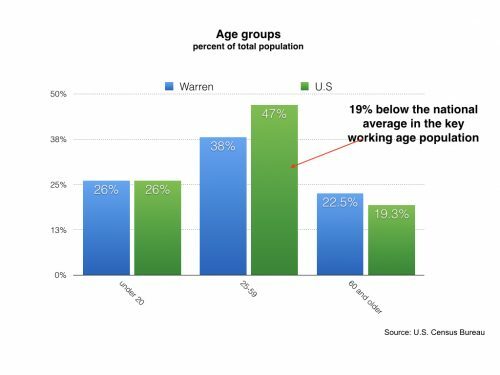 When you look at the first chart in this post (right) it appears that Warren tracks the national median age pretty closely. We are a little older (38.5 v 37.6 years), but not much. Digging a little deeper reveals the important insight. The second chart (below) segments the population by age groups. We hold on to people < 20 years of age; they represent 26% of Warren’s population, the same as the country as a whole. But once people hit 25 we start losing them. The Census data can’t tell us why that is, but most people would agree that this is about the time many people give up on Warren and move elsewhere in search of opportunity. 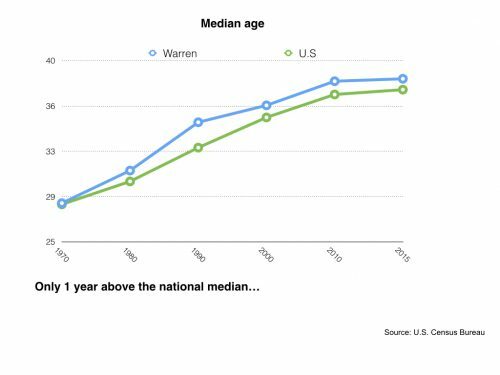 This shortfall holds all the way up to the age of 60 — the prime working years for most people. These are also the prime years for marriage and having children, which is necessary to replace those who die. We aren’t keeping up, which is part of the reason Warren continues to shrink. People in this age group are also the biggest spenders. They form families, buy houses, furniture, children’s clothes and toys. They buy minivans and SUVs. These are the people most prized by marketers. If you want to know why we don’t have a Trader Joe’s in Warren, here is half the reason. It isn’t just a matter of income. The differential in the mix of people 25-60 between Warren and the U.S. is enormous. A nine percentage point lag sticks out as a large red flag. Unfortunately, the age mix is also a major factor companies look at when considering a potential new location for a business. They want to know if the available workforce is adequate to the task, and we do not present an ideal profile. In this case, younger is better. Posted Thursday, March 16th, 2017 under Economic development.